Characters from the new Disney/Pixar film Finding Dory will be joining Turtle Talk with Crush at Epcot’s The Seas with Nemo and Friends and Disney California Adventure this summer. The new characters include Destiny the whale shark, Bailey the beluga whale, and Hank the septopus (a seven-legged octopus). Crush and Squirt will still be swimming up to the ‘Human Tank’ during the show. Finding Dory tells the story of Dory, Nemo, and Marlin as they head out on an adventure to find answers about Dory’s past and her family. The film is directed by Andrew Stanton (Finding Nemo) and stars the voices of Ellen DeGeneres, Albert Brooks, Ed O’Neill, Katilin Olson, Ty Burrell, Eugene Levy, and Diane Keaton. Finding Dory swims into theaters on June 17. 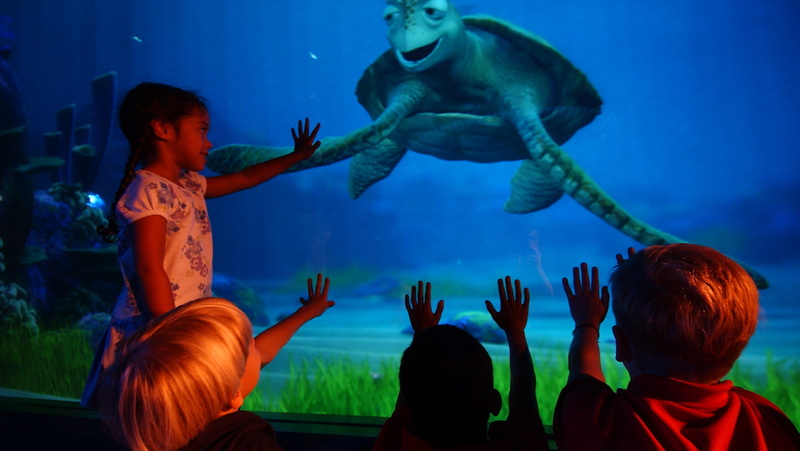 The characters from Finding Dory will debut in Turtle Talk with Crush in early May. You can check out the full trailer for Finding Dory here.